Thousands of miles off the southeast coast of the African continent is an island nation located in the Indian Ocean known as Mauritius. 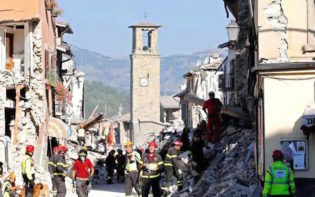 With a population of over 1.2 million, the country is small in size, however its celebrations are grand with different cultures, religions and festivals. The culture of Mauritius involves the blending of several societies from its history, as well as separate culture arising indigenously. The population comes from three continents which has inevitably brought traditions and beliefs from their ancestral countries. The number and diversity of public holidays and festivals emphasise the rich heritage of the island’s people and its ethnic diversity. Tourism tends to rise during this particular season with three huge festivals taking place on the island, uniting both locals and guests to celebrate and take part in a spirit of peace and harmony. 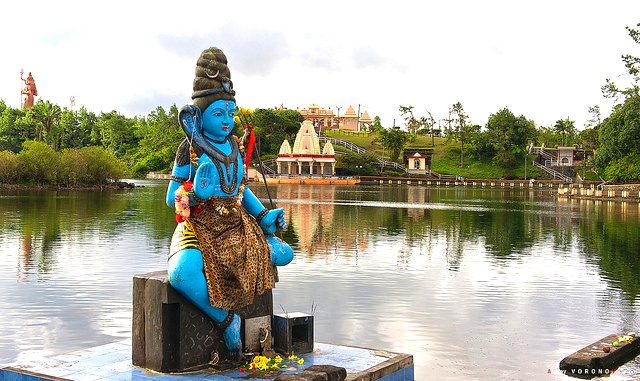 The religions found in Mauritius are mainly Christian, Hindu, Muslim and Buddhism. Each culture has their traditions, beliefs and their festivals on the island. 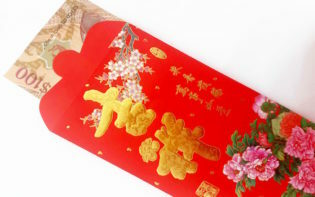 Chinese Spring Festival, also known as Chinese New Year, has thousands of years of history and is traditionally celebrated by the Mauritian Chinese of Mauritius. It celebrates family unity and hopes, allowing it to be a time for whole families to get together and acknowledge the New Year with quantities of food and drinks, especially fish dishes. As part of the celebrations firecrackers are set off in order to drive away the undesired spirits known as “nian” who feared the colour red as it symbolised happiness. 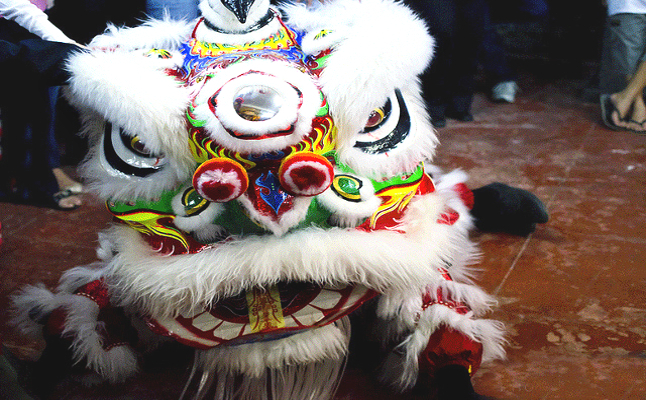 The festival consist of parades with figures of dancing dragons, lions and firework displays. 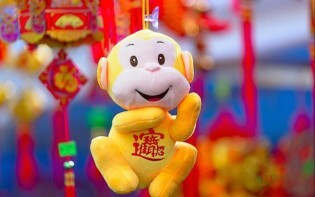 The main celebrations are held in the capital city Port Louis in China town during the month of January or February as the precise date for the celebrations are chosen in accordance to the Chinese lunar calendar. The Cavadee Festival is a religious festival originating from an ancient Tamil legend and is renowned mainly by Indians of Tamil origin. A period of fasting lasting ten days usually takes place where afterwards many have certain parts of their body pierced with needles before going to the temple with their offerings on their backs. This process is to purify both the soul and heart while a bracelet is tied onto their wrists to denote their devotion. The devotees who appear to be in a trance, walk bare feet to the temple, while carrying on their back the Cavadee meant to symbolise the holy mountains. There are also fire-walking and sword-climbing rituals as part of the ceremony taking place from the end of January until February. Rituals performed as part of the ceremony. 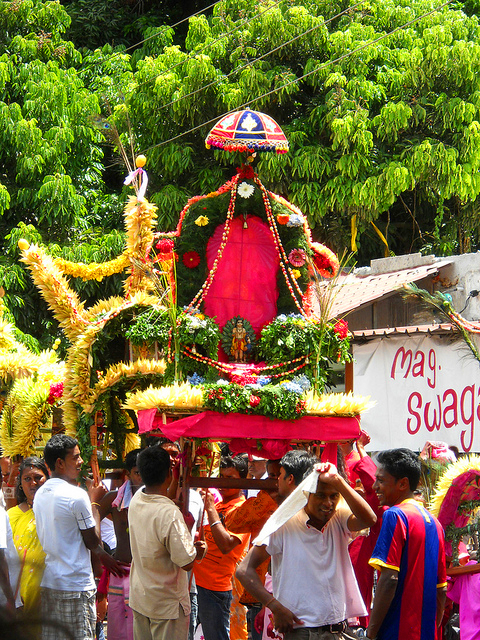 Thaipoosam Cavadee is one of the most popular festivals celebrated by Indo-Mauritians with ritual mortifications, washings and fasting. 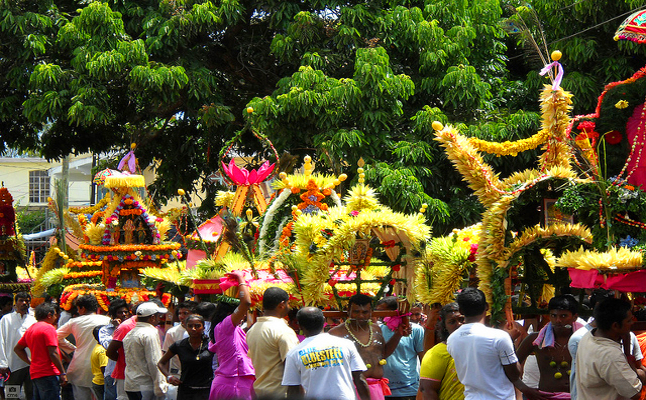 This festival, held in February according to the Tamil calendar, is celebrated by all Hindus at temples throughout Mauritius. The streets are filled with devotees dressed in fuchsia or saffron coloured outfits, carrying their offerings while singing or reciting prayers. Some may choose to fulfil their vows by piercing their tongues and cheeks as part of their worship to the second son of Lord Shiva. The distinctive characteristic of Thaipoosam Cavadee may entrance visitors who have never witnessed such sights before. Besides the festivals there are many sights and monuments to observe throughout the country. Aapravasi Ghat Immigration Depot for instance, is a UNESCO World Heritage site. It is the only surviving remainder of an immigration terminal typical of those established in the second half of the 19th Century to welcome skilled labourers. The East is commonly known as “The Jewel in Mauritius Crown” with remote villages, lagoons and beaches (Belle Mare). 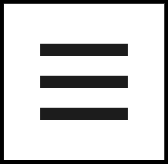 In the highlands there are the islands of four other towns: Quatre Bornes, Curepipe, Rose Hill and Vacoas. The northern coast of the island is where the most development has taken place in recent years; restaurants, discotheques enhance the night life for its guests. For those that enjoy history and education, the Dodo bird was only indigenous in Mauritius and put the country on the world’s map. The country’s National History Museum is where one of the few remaining skeletons is on display. 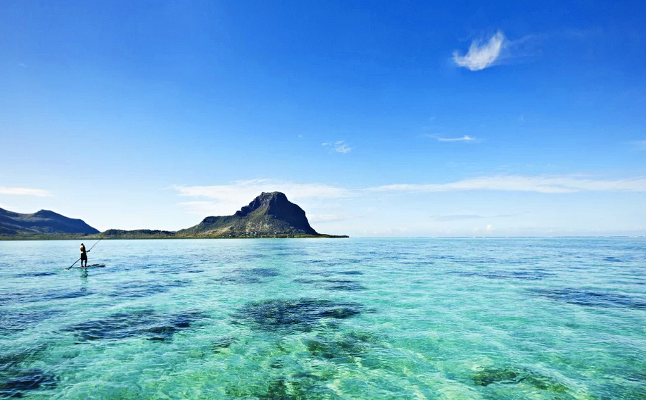 Mauritius offers much to its visitors and may captivate them with such beauty as the Seven Coloured Earths or simply by partaking in one of the many festivals this season. In what ways may cultural and religious diversity be celebrated in unity?